Last night, I was lucky enough to be invited to the first Fashion Club event organised by Smart Works, the amazing charity we support at Mantra. Smart Works provides support to disadvantaged women trying to get back to work, through practical clothing and styling support, and confidence-building coaching. 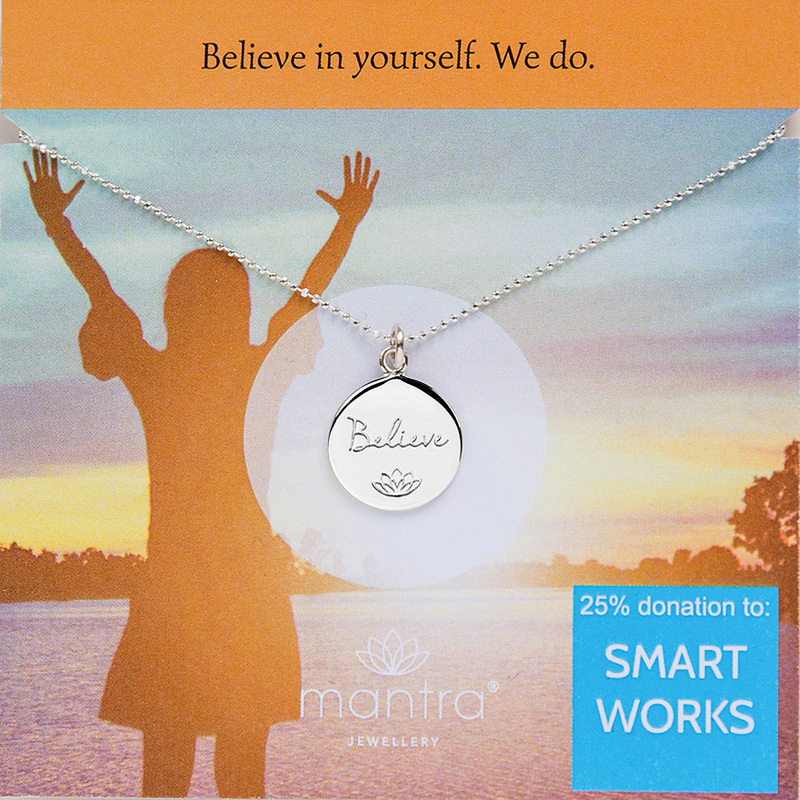 We support Smart Works with our 'Believe' disc necklace, with 25% going directly to the charity. Samantha Cameron was the first speaker at their inaugural Fashion Club event, talking about the inspiration behind her new clothing brand, Cefinn. Not only was Sam brilliantly down to earth and engaging, but she also looked even more glamorous in real life! Her designs are just lovely: aimed at working women, who want something smart, different, well-made and with a fashion sensibility - but also practical, wearable and washable. As someone who has been in the public eye hugely, whilst also having a senior role at Smythson and three children to look after, Sam knows how important clothes are to how you look, how you function, and how you feel. I loved what she had to say, and I loved many of her designs. When asked whom she would love to see in her designs, she said any woman who inspires other women - but then, very honestly, she also said, 'Michelle Obama'. 'She is even better than anything you've read in the press, warm, supportive.. I was very lucky to get to know her a bit', explained Sam. What many of us did not know was that Sam has been volunteering at Smart Works as a stylist for over a year. Another wonderful speaker tonight was Terri Sydney, one of the many thousands of women Smart Works has helped. 'Smart Works changed my life. This jacket - I now wear it for any important interview or meeting. When I wear it - I know that anything is possible'. Alongside her job, Terri is studying for a masters in fashion psychology, and completely gets how important how we dress is for our self-confidence, self-belief and self-image. What a superb ambassador for Smart Works! To support this fantastic charity, please buy a 'Believe' disc necklace. 25% of the purchase price goes directly to Smart Works, whether you buy it from Fabulous or from our mantra website direct. Buy one for your daughter going through her exams, or gearing up for university. For your best friend, setting up her business. For your colleague, leaving for the next step in her career. Or for yourself, to remind you of all the support you have from women the world over, whether you know them or not.